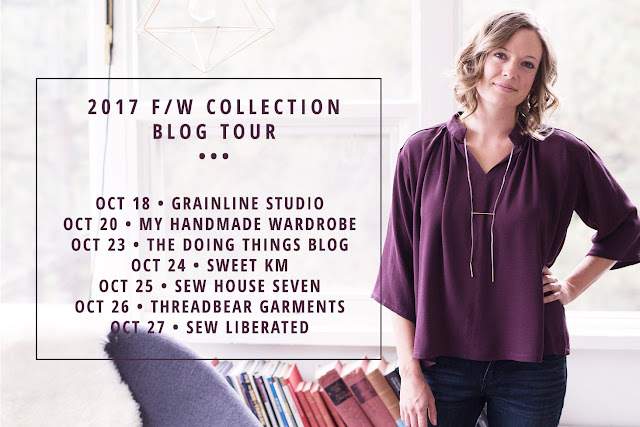 Have you seen the Indiesew Fall Collection? 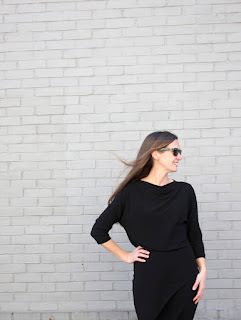 It includes 5 great garments that cover all the bases for transitional dressing. I have been meaning to make a second, more versatile, Tamarack Jacket since I made my first one two years ago! Celebrating the Indie Sew Fall Collection was just the kick in the pants I needed to get this coat out of the planning stages, and under the quilting needle. It's the perfect coat for fall. 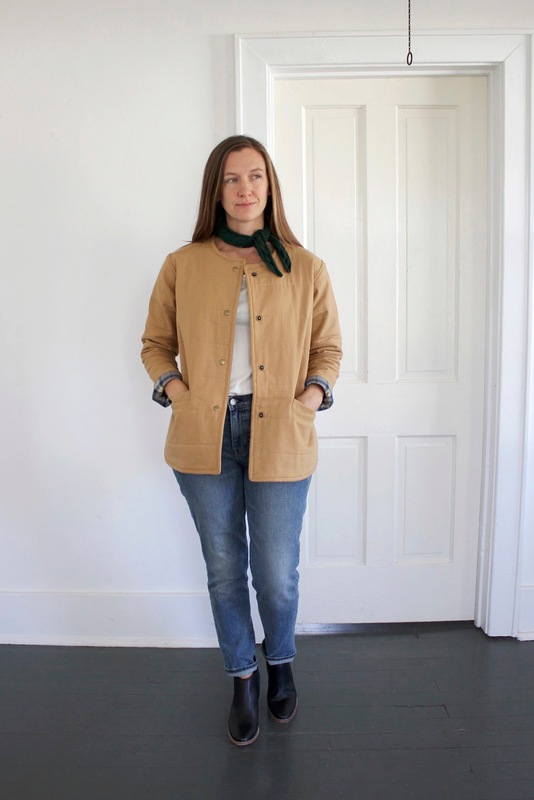 Over a tee, or over a sweater, with a chunky cowl, or totally bare, the Tamarack Jacket is the layer that fills the outwear gap in my handmade wardrobe. I love this color! Possibly too much. As with my previous chambray obsession, that I haven't fully recovered from, everything can't be tan. When everything is tan, nothing goes together! 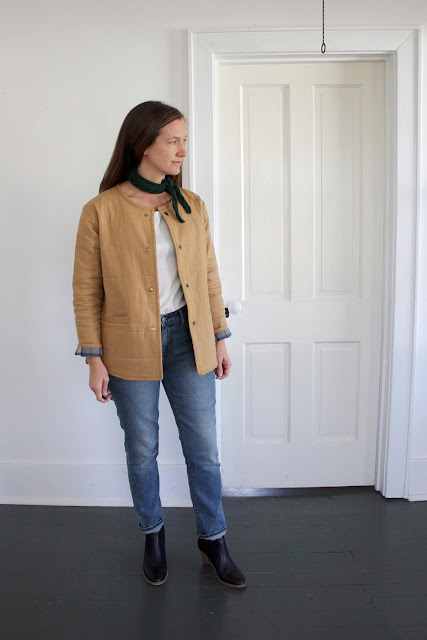 Luckily, tan compliments all the black and chambray/denim I've sewn in the past. I love this fabric (similar)! Which is a relief because when I got it I was worried it would be too plain (is that possible?) to do this pattern justice. But from the second I sewed up the side seams I didn't want to take this jacket off. The arms were wrinkly from wear before I had even finished sewing! The exterior fabric is Robert Kaufman Essex Linen Blend (similar) in Leather Gold from Fabric.com. The cotton/linen blend gives the fabric a rumpled texture that adds some character to the basic color. 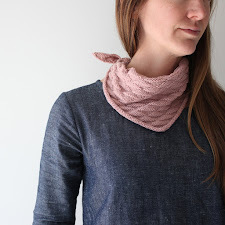 (Check out Erica's sleek version in the same fabric, different color!) The interior is Robert Kaufman Mammoth Flannel Plaid in Steel also from Fabric.com. It's deliciously soft and high quality. Mammoth Flannel is pretty sturdy and I was worried it would be too rigid when quilted together with the Essex. Using the 3.5" spaced line quilting pattern, as opposed to the diamond quilting, allows the layers to move even with the thicker fabric. I made a 6/8/10 bust/waist/hip based on my measurements. I suspect I didn't need to go the whole way to 10 at the hips, this pattern has plenty of ease through the body. I chose the newish View B with the snap front opening. And used widely spaced horizontal lines of quilting. The minimal quilting makes the sewing go so much faster than the diamond quilting pattern. The possibilities are endless for fabric combinations and quilting patterns for this jacket. I love Shannon's version with the pieced bottom. For the interior finishing I added a hanging loop at the neck center back, and bias bound the pocket bags. I took a lucky chance at matching the plaid of the pocket bags with the interior. I serged all of the edges before sewing the seams, then pressed them open and top stitched 1/4" from the seam to tack down the selvage edges. 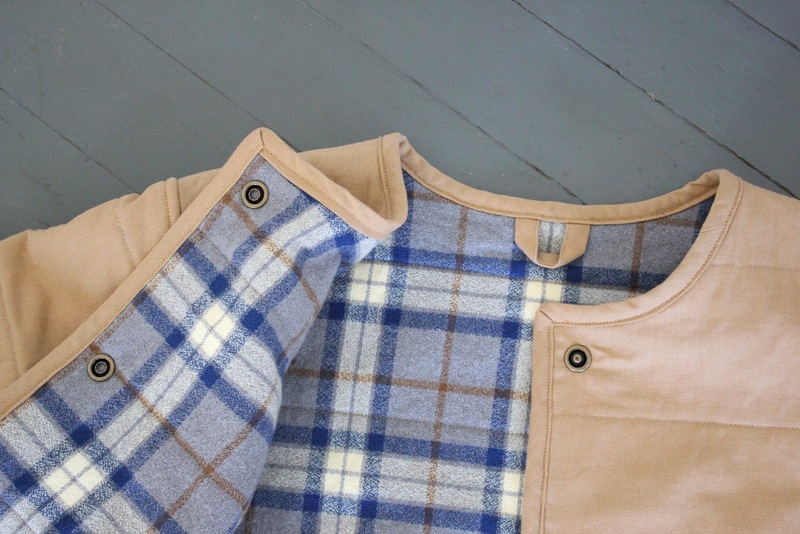 The Tamarack checks all the boxes for fall layering. Today I'm wearing it was a rolled Fragment Scarf, and Blanc Tee. 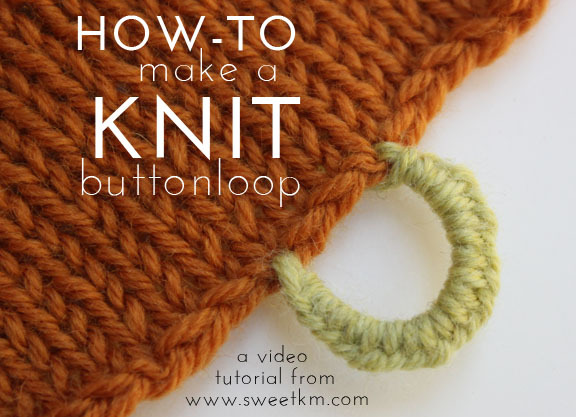 I can't wait to try it out with my chunky seed stitch cowl, or a turtle neck. The only thing my Tamarack Jacket is missing is weather cool enough to wear it! 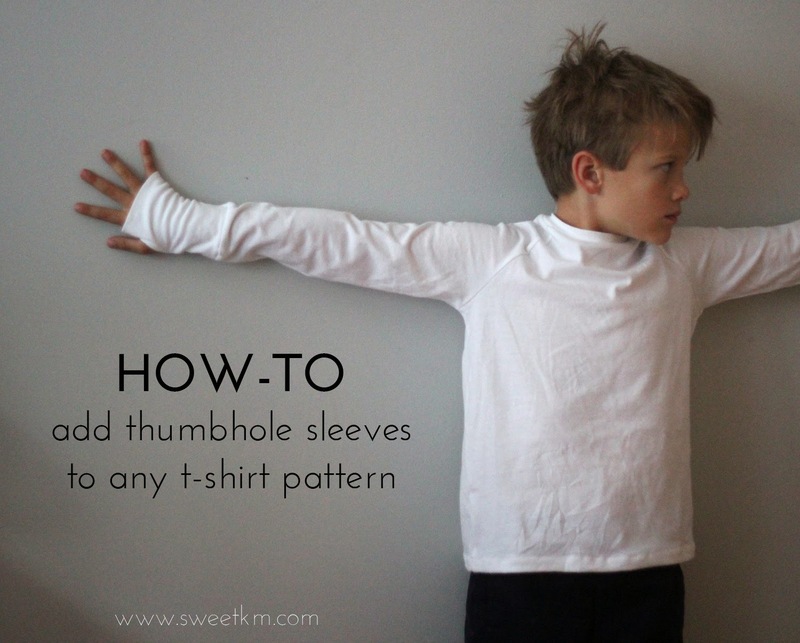 The Tamarack Jacket pattern was provided to me by Indiesew. Please trust that my review is sincere. Fabric.com links are affiliate links. I purchased and selected the fabrics myself. 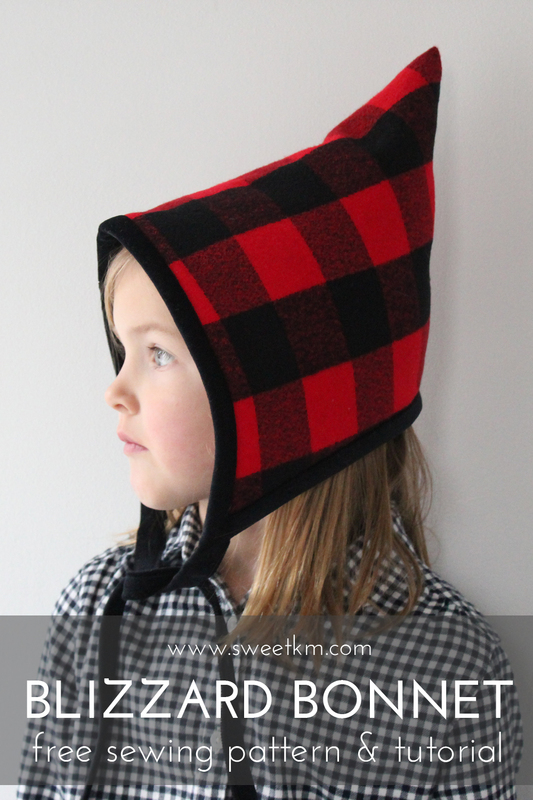 It’s a great colour on you, looks very chic and cosy! Love this! This jacket is next on my list and I also selected Essex and Mammoth flannel! (But in black and a grey/red plaid) Did you skip the batting as a middle layer?